Recently, one of the major live OTT services shared with me their licensing costs broken out per channel. I agreed not to disclose which live platform this comes from and the pricing listed doesn’t mean this is what every live TV company pays or that the platform carries all of these specific channels. There are variations based on length of contract and number of subscribers. Most of the pricing listed is for 2 years, but some are 5 years. For this specific unnamed platform, ESPN pricing is 3 years. Also, a few of the content providers require an ad split, while others don’t. The costs are per subscriber, per month. The channel pricing listed gives a good insight into one of the major costs of running a live OTT platform and when you add in the distribution costs, and all the technical pieces of the workflow, on top of the content costs, it’s not possible to run a profitable streaming live TV business. Even at scale, I don’t know of any live OTT service that isn’t losing money which is why all of the major services are owned by MVPDs, ISPs, or others that can afford to lose money on the service, since their offering is part of a bigger product ecosystem. Some of the live TV platforms have told me they think that with the growth of their service they can push back on TV network licensing costs, or drop unwanted networks. But no MVPD to date has been able to do this, so I don’t see the streaming platforms having any better leverage. 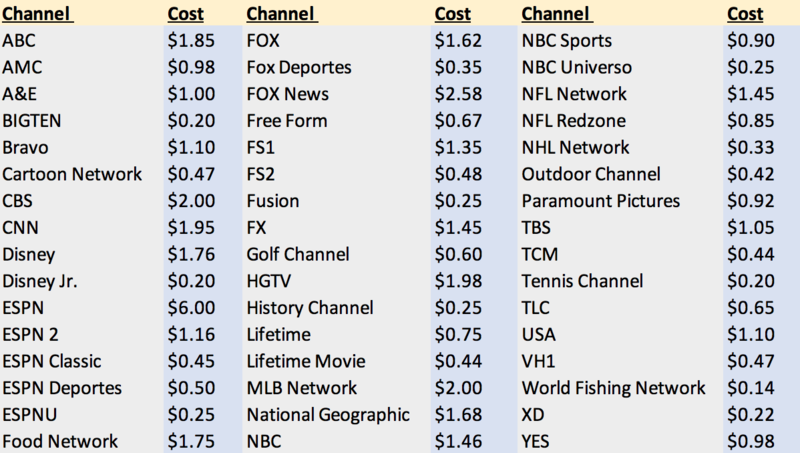 With content licensing costs rising, it’s the main reason why nearly all of the live streaming TV services raised the cost of their packages by $5 last year. Like it or not, live TV streaming is only going to get more expensive for consumers.